There are so many chapters to our lives, changes that may happen when we least expect it. No one would know that better than Rosie. While she’s used to the status quo of her life, existing primarily for her family and for their needs, she suddenly finds herself amidst a huge shift in her world. The rug has been pulled from under her, and Rosie has to find a new way of living, of being. It isn’t easy when you’re looked upon a certain way. Rosie feels as though her family attempts to coddle her with kid gloves. Sure, she’s entering a new chapter in her life. She’s not getting any younger, at sixty-five. Yet, they want to keep tabs on her at every moment, as if she’s no longer an adult. As though she’s unable to care for herself or provide for herself anymore. Those who love her mean well, but Rosie can’t help but feel stifled. Decades earlier, when Rosie was on the cusp of eighteen, she met a lovely young man who she fell head over heels in love with. Someone who seemed to know her, inside and out, encouraging her to take the world by storm. After a falling out, he left her feeling unwanted and very much alone. Her life took a completely different turn then she’d planned on. Gone were the dreams of reaching Paris and living off of her artwork, her paintings. The more she aged, the more she knew she had to be realistic, closing herself off to the possibility of fulfilling her deepest aspirations. This also meant closing the door on that lovely young man who stole her heart. What are the chances that she’d run into him again, forty-seven years later? 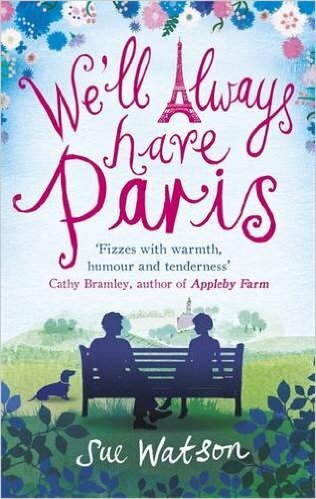 I loved Sue Watson’s latest masterpiece, We'll Always Have Paris. I felt the pangs of anxiety and excitement when Rosie laid eyes on her lost love again, after all the decades between them. I also felt the sharp pain and resentment she had towards him, especially when she lets out secrets that she’s tried hard to suppress for all that time. Secrets only he would understand. While I’m not Rosie’s age, I can identify with feeling as though I’m still a young woman wrapped inside an older woman’s shell. I think many of us can recall that eighteen year old self, the prospect of an endless future ahead of us. 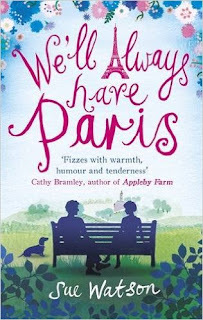 What I love most about Sue’s novels, though, is this: she reminds us that, no matter how old we are, we can still keep living, and dreaming. That we should never totally close the book on our passions in life, no matter how many chapters we live to tell about, and that ultimately, it’s really about the people you surround yourself with, the people who love you, who matter most. Age is a matter of mind... and joint health.